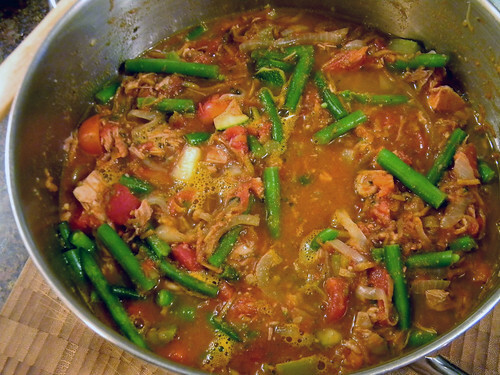 Moroccan Turkey Stew - Thanksgiving #SundaySupper leftovers | What Smells So Good? Add onion and cook until golden, about 8-10 minutes. Stir in garlic, peppers, carrots and zucchini. Cook 5 minutes, until softened. Stir in chicken, spices, tomatoes, stock and honey. Cover and simmer 30 minutes. Add beans, re-cover and cook 5 minutes.